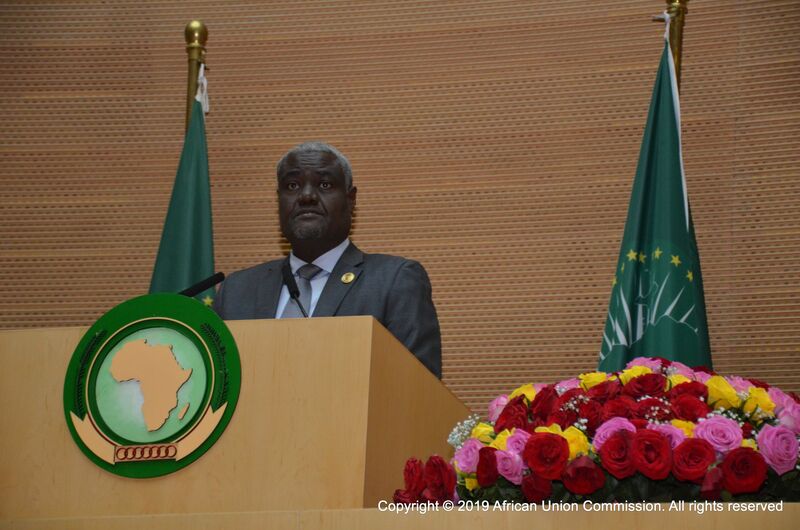 Addis Ababa, Ethiopia 7th February 2019: The Chairperson of the African Union Commission (AUC) H.E Moussa Faki Mahamat, has described the progress made in the ratification of the African Continental Free Trade Area (AfCFTA) as “particularly encouraging”. “At the current pace of ratification, we can anticipate the entry into force of the agreement in the coming weeks. I hope that the six countries that have not yet signed this instrument will do so in the shortest possible time and that those who have already taken this step will quickly conclude the ratification procedures”, Mr Faki Mahamat said, as he addressed the opening ceremony of the African Union’s (AU) Executive meeting in Addis Ababa today. The AfCFTA is one of the AU’s priority projects under Agenda 2063. “An Africa in search of growth cannot afford the luxury of camps of unproductivity, with its kids out of schools and women living in a state of entrapment,” said United Nations Under Secretary General and Executive Secretary of the UN-Economic Commission for Africa (UNECA), Dr. Vera Songwe in her opening remarks to the ministerial meeting. She noted that “Africa has the second highest burden of displacement, hosting about 37 percent of the world’s 19.6 million refugees and having 39.1 million internally displaced people. She urged the Ministers not to overlook the importance of the conventions and frameworks that the African Union has put in place, notably, the Kampala Convention in 2009, and the adoption of the Protocol on Free Movement, Right of Residence and Right of Establishment in January 2018 which, if implemented, can boost regional integration. Dr Songwe also pointed out that prolonged conflicts are a major contributing factor of the displacements on the continent, resulting from broken institutions, governance and leadership. H.E Dr. Richard Sezibera, Chairperson of the Executive Council, in his opening address pointed out the importance of the Executive Council meeting, as the Union is undergoing institutional reforms which will ensure the efficient running of the AU Commission. “The new scale of assessment for the contribution of both the regular budget and the peace fund are paramount in the quest to self-financing of the Union and continental leadership, hence there is need to ensure its speedy implementation and follow-through”, said H.E Dr. Richard Sezibera.